In the ” Catholic” post’s comments ( thanks again, all! 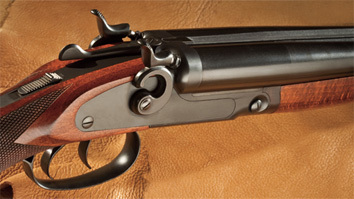 ), there was mention of a Stoeger Coach gun. Being the widespread choice of Southern belles everywhere, I thought we might spend a post or two in discussion of well-engineered firearms that were/are designed with particular applications in mind. Coach guns have a very unique history. Historically, coach guns were manufactured by Remington and Colt. They were issued to stagecoach drivers by Wells Fargo when they first established a delivery run from Tipton, Missouri to San Francisco in 1858. A coach would have two men up top; one handling the reins, and the other ” riding shotgun.” The gun fired a buck-and-ball blackpowder cartridge that was horrifically effective at short range. No accuracy necessary. The bad guy riding alongside the coach just…went away. Had there been only one driver, he could hold the reins and still use the coach gun in his other hand. Early coach guns were rumored to be used by Confederate cavalry. The Confederates were much less formal than their Federal counterparts as to their uniform and accoutrement applications, and anything that you had and could use effectively was likely to be acceptable. A coach gun or any of several short-barrel carbines were popular. They could all be worn on a short shoulder sling and brought into use in a matter of seconds. Another favorite is the 1842 Mississippi smoothbore musket. ” Smoothbore” refers to the inside surface of the barrel itself; these had an effective range of app. 200 yds. ” Rifling” refers to a tight spiral on the inside surface that increased range to almost 500 yds. This accounts for the alarming number of casualties in any typical infantry engagement. The field tactics were still entirely Napoleonic in nature ( up close and very personal ), but they could now shred one another long before they got that close. So…they did. These are so beautifully designed that it’s hard to believe that they came from that era. Although they’re a bit ungainly while carrying them or going through the manual of arms, when you raise it to the firing position it just settles into a perfect balance. You could hold this at arm’s length, balance it on one finger and stand there all day. Exquisite. These would mount a very old-school saber bayonet that was about 2ft. in length; absolutely terrifying. Another absolutely magnificent weapon is the Henry repeating rifle. This looks very clunky and uncomfortable, but balances perfectly when in firing position. Was often mounted with a long-range scope and used by sharpshooters. If memory serves, I believe it was a Henry that got to Gen. John Reynolds on the first day of Gettysburg; a shot from almost a mile away. Well…that should do it for today, kids. I think next time, we might look at some period artillery! Try to contain your excitement….